Lambdas are a great addition to the language since C++11, although a problem arises despite the convenience: lambdas are anonymous and thus can create confusions in debugging. 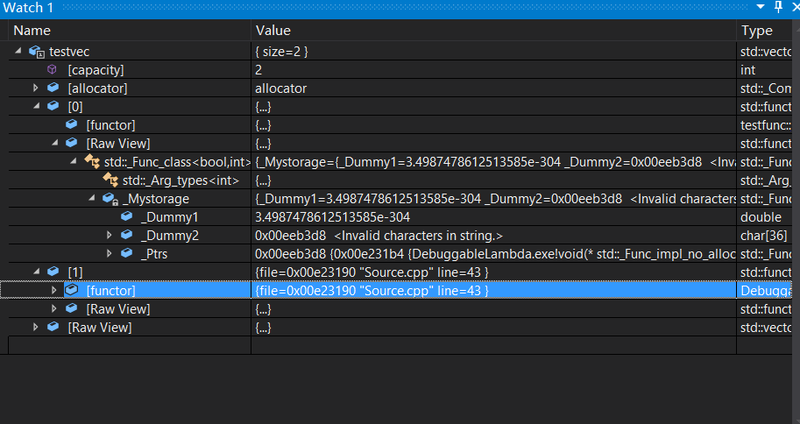 Particularly, when the lambda is stored into std::function, a type-erased container, Visual Studio loses track of the lambda's symbol and following the function call becomes a pain. 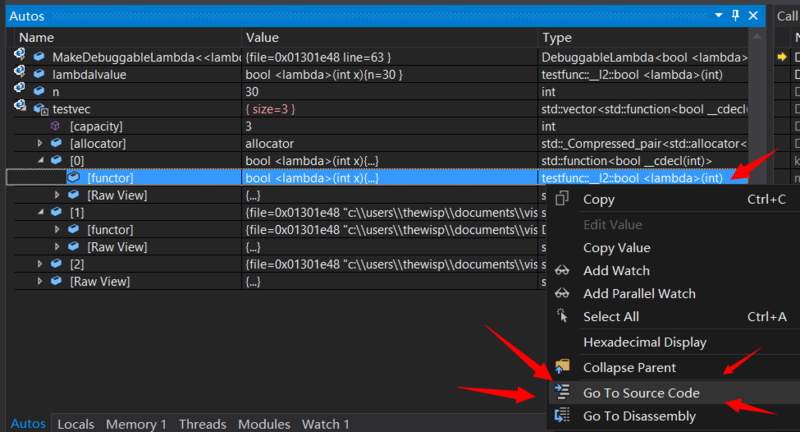 has shown some latest effort from the Visual Studio team to improve the debugging when calling a std::function, however, it does not help when one wants to inspect a function without calling it, for instance, the content of a std::vector<std::function<...>>. Actually, it is still possible to indicate the lambda even when it has no name: wrap the lambda along with its file and line information. The wrapper can be further compiled out in the final build so it does not impact the performance. Considering a lambda is an instance of an anonymous struct, we can benefit from operator inheritance without having to use C++17's invoke or result_of. Note that the lambda can be either lvalue or rvalue and is forwarded to the base class constructor. Finally, we need the macro to acquire file and line information. Yay! now it displays the location of that lambda without having to follow the call stack.